Pneumatic tires are used on all types of vehicles, from cars to earthmovers to airplanes. Tires enable vehicle performance by providing for traction, braking, steering, and load support. Tires are inflated with air, which provides a flexible cushion between the vehicle and the road that smoothes out shock and provides for a comfortable ride quality. Pneumatic tires are made of a flexible elastomer material such as rubber with reinforcing materials such as fabric and wire. Tire companies were first started in the early twentieth century, and grew in tandem with the auto industry. Today, over one billion tires are produced annually, in more than four hundred tire factories, with the three top tire makers commanding a 60 percent share of the global market. 1892 - Beaded edge tires introduced in the U.S. The tire tread is that portion of the tire that comes in contact with the road. The tread is a thick rubber compound formulated to provide a high level of traction that does not wear away too quickly. The tread pattern is characterized by the geometrical shape of the grooves, lugs, and voids. Grooves run circumferentially around the tire, and are needed to channel away water. Lugs are that portion of the tread design that contacts the road surface. Voids are spaces between lugs that allow the lugs to flex. Tread patterns feature non-symmetrical lug sizes circumferentially in order to minimize noise. Treads are often designed to meet specific product marketing positions. High performance tires have small void ratios to provide more rubber in contact with the road for higher traction, but may be compounded with softer rubber that wears quickly. Mud and snow tires are designed with higher void ratios to channel away rain and mud, while providing better gripping performance. Tread voids provide space for the lug to flex and deform as it enters and exits the footprint. Voids also provide channels for rain water to flow out of the footprint. Voids also provide space for mud and snow to be channeled away from the footprint. The void ratio is the void area of the tire divided by the entire tread area. Low void areas have high contact area and therefore higher traction. The rain groove is a design element of the tread pattern specifically arranged to channel water away from the footprint. Rain grooves are circumferential in most truck tires. Many high performance passenger tires feature rain grooves that are angled from the center toward the sides of the tire. Some tire manufacturers claim that their tread pattern is designed to actively pump water out from under the tire by the action of the tread flexing. Tread lugs often feature small narrow voids, or sipes, that improve the flexibility of the lug to deform as it traverses the footprint area. This reduces shear stress in the lug and reduces heat buildup. Wear bars are raised features located at the bottom of the tread grooves that indicate excessive tire wear. When the tread lugs are worn to the point that the wear bars connect across the lugs, the tires are fully worn and should be taken out of service. The contact patch, or footprint, of the tire is the area of the tread in contact with the road. This is the area that transmits forces between the tire and the road via friction. The area of the contact patch is proportional to the amount of traction. The length-to-width ratio of the contact patch will affect steering and cornering behavior. The bead is that part of the tire that contacts the wheel. The bead is reinforced with steel wire, and compounded from high strength, low flexibility rubber. The bead seals against the wheel tightly to ensure that the tire holds air without leakage. The bead fit is tight also to ensure the tire does not shift circumferentially as the tire rotates. The sidewall is that part of the tire that bridges between the tread and bead. The sidewall is reinforced with rubber and fabric plies that provide for strength and flexibility. The sidewall transmits the torque applied by the drive axle to the tread in order to create traction. Sidewalls are molded with decorative ornamentation, government-mandated warning labels, and other consumer information. The shoulder is that part of the tire at the edge of the tread as it makes transition to the sidewall. Bicycle tires and some passenger and truck tires are designed for use with inner tubes. Inner tubes are torus-shaped balloons made from a compound impervious to air leakage. The inner tubes are inserted into the tire and inflated to give the tire its final shape. Tires are mounted to wheels, or rims, that bolt to the drive axle. Automotive wheels are either made from cast metal alloys, or stamped/welded metal. The valve stem is a tubular rubber shape with a metal valve used to inflate the tire with air. Valve stems usually protrude through the wheel for easy access for inflation. Tires are inflated through a valve, typically a Schrader valve on automobiles and most bicycle tires, or a Presta valve on high performance bicycles. 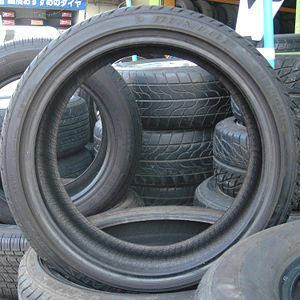 Tires are specified by the manufacturer with a maximum load rating. Loads exceeding the rating can result in unsafe conditions that can lead to steering instability and even rupture. Tires are specified by the manufacturer with a recommended inflation pressure that permits safe operation within the specified load rating. The speed rating denotes the maximum speed at which a tire is designed to be driven for extended periods of time. The ratings range from 99 miles per hour (mph) to 186 mph. Tires often exhibit irregular wear patterns once installed on a vehicle and partially worn. Tire Rotation is the procedure of moving tires to different car positions, such as front-to-rear, in order to even out the wear, thereby extending the life of the tire. Once mounted on the vehicle, the tire may not be perfectly aligned to the direction of travel, and therefore exhibit irregular wear, often quite substantial. Wheel Alignment is the procedure for checking and correcting this condition through adjustment of camber and toe angles which also affect the handling characteristics of the vehicle. Tires that are fully worn can be remanufactured to replace the worn tread. Retreading is the process of buffing away the worn tread and applying a new tread. Retreading is economical for truck tires because the cost of the replacement is small compared to the cost of the tire carcass. Retreading is less economical for passenger tires because the cost is high compared to the cost of a new tire. Hydroplaning is the condition where a layer of water is present between the tire and road. Hydroplaning occurs when the tread pattern cannot channel away water at a rate of speed to ensure a complete dry footprint area. When hydroplaning occurs the tire loses traction and steering, and creates a very unsafe driving condition. The DOT Code is an alpha-numeric character sequence molded into the sidewall of the tire for purposes of tire identification. The DOT Code is mandated by the U.S. Department of Transportation. The DOT Code begins with the letters "DOT" followed by a two numbers or letters plant code that identifies where it was manufactured. The last four numbers represent the week and year the tire was built. For example, the numbers 3197 means the 31st week of 1997. The other numbers are marketing codes used at the manufacturer's discretion. The DOT Code is useful to identify tires for recall. All tires sold in Europe after July 1997 must carry an E-mark. The mark itself is either an upper or lower case "E" followed by a number in a circle or rectangle, followed by a further number. An "E" (upper case) indicates that the tire is certified to comply with the dimensional, performance and marking requirements of ECE regulation 30. An "e" (lower case) indicates that the tire is certified to comply with the dimensional, performance and marking requirements of Directive 92/33/EEC. The number in the circle or rectangle denotes the country code of the government that granted the type approval. The last number outside the circle or rectangle is the number of the type approval certificate issued for that particular tire size and type. Tire manufacturers usually embed a mold serial number into the sidewall are of the mold, so that the tire, once molded, can be traced back to the mold of original manufacture. Tires are classified into several standard types based on the type of vehicle they serve. Since the manufacturing process, raw materials, and equipment vary according to the tire type it is common for tire factories to specialize in one or more tire types. In most markets factories that manufacture passenger and light truck radial tires are separate and distinct from those that make aircraft or OTR tires. High Performance tires are designed for use at higher speeds. They feature a softer rubber compound for improved traction, especially on high speed cornering. The trade off of this softer rubber is lower tread life. High performance street tires sometimes sacrifice wet weather handling by having shallower water channels to provide more actual rubber tread surface area for dry weather performance. The ability to provide a high level of performance on both wet and dry pavement varies widely between manufacturers and even tire models of the same manufacturer. This is an area of active research and development, as well as marketing. Mud and Snow, or M+S, is a classification for winter tires designed to provide improved performance under winter conditions compared to tires made for use in summer. 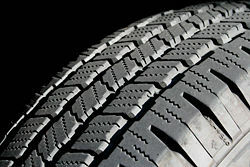 The tread compound is usually softer than that used in tires for summer conditions, thus providing better grip on ice and snow, but wears more quickly at higher temperatures. Tires may have well above average numbers of sipes in the tread pattern to grip the ice. • Dedicated winter tires will bear the "Mountain/Snowflake Pictograph" if designated as a winter/snow tire by the American Society for Testing & Materials. Winter tires will typically also carry the designation MS, M&S, or the words MUD AND SNOW (but see all-season tires, below). • Some winter tires may be designed to accept the installation of metal studs for additional traction on icy roads. The studs also roughen the ice, so providing better friction between the ice and the soft rubber in winter tires. Use of studs is regulated in most countries, and even prohibited in some locales due to the increased road wear caused by studs. Typically, studs are never used on heavier vehicles. Studded tires are used in the upper tier classes of ice racing. • Other winter tires rely on factors other than studding for traction on ice, e.g. highly porous or hydrophilic rubber which adheres to the wet film on the ice surface. • Some jurisdictions may from time to time require snow tires or traction aids (e.g. tire chains) on vehicles driven in certain areas during extreme conditions. • Mud tires are specialty tires with large chunky tread patterns designed to bite into muddy surfaces. The large open design also allows mud to clear quickly from between the lugs. Mud terrain tires also tend to be wider than other tires, to spread the weight of the vehicle over a greater area to prevent the vehicle from sinking too deeply into the mud. The all-season tire classification is a compromise between one developed for use on dry and wet roads during summer and one developed for use under winter conditions. The type of rubber and the tread pattern best suited for use under summer conditions cannot, for technical reasons, give good performance on snow and ice. The all-season tire is a compromise, and is neither an excellent summer tire nor an excellent winter tire. They have, however, become almost ubiquitous as original and replacement equipment on automobiles marketed in the United States, due to their convenience and their adequate performance in most situations. All-season tires are also marked for mud and snow the same as winter tires. Owing to the compromise with performance during summer, winter performance is usually poorer than a winter tire. All-terrain tires are typically used on SUVs and light trucks. These tires often have stiffer sidewalls for greater resistance against puncture when traveling off-road and the tread pattern offers wider spacing than all-season tires to remove mud from the tread. Many tires in the all-terrain category are designed primarily for on-road use, particularly all-terrain tires that are originally sold with the vehicle. Vehicles typically carry a spare tire, already mounted on a rim, to be used in the event of flat tire or blowout. Minispare tires are smaller than normal tires to save on trunk space, gas mileage, weight and cost. Minispares have a short life expectancy, and low speed rating. Several innovative designs have been introduced that permit tires to run safely with no air for a limited range at a limited speed. These tires feature still load supporting sidewalls and often plastic load-bearing inserts. Heavy Duty tires are also referred to as truck/bus tires. These are the tire sizes used on vehicles such as commercial freight trucks, dump trucks, and passenger busses. Truck tires are sub-categorized into specialties according to vehicle position such as steering, drive axle, and trailer. Each type is designed with the reinforcements, material compounds, and tread patterns that best optimize the tire performance. The OTR tire classification includes tires for construction vehicles such as backhoes, graders, trenchers, and the like; as well as large mining trucks. These tires are built with a large number of reinforcing plies to withstand severe service conditions and high loads. OTR tires are used in rather low speed conditions. The agricultural tire classification includes tires used on farm vehicles, typically tractors and specialty vehicles like harvesters. High floatation tires are used in swampy environments and feature large footprints at low inflation pressures. Racing tires are highly specialized according to vehicle and race track conditions. This classification includes tires for top fuel dragsters, oval track racers, jet-powered trucks, and monster trucks, as well as the large-market race tires for Formula One and NASCAR. Tires are specially engineered for specific race tracks according to surface conditions, cornering loads, and track temperature. Tires have also been specially engineered for drift racing. Racing tires are often engineered to minimum weight targets, so tires for a 500-mile race may run only 300 miles before a tire change. Tire makers invest heavily in race tire development as a means of advertising promotion. The industrial tire classification includes pneumatic and non-pneumatic tires for specialty industrial vehicles such as skid loaders and fork lift trucks. This classification includes all forms of bicycle tires, including racing tires, mountain-bike tires, and snow tires. Aircraft tires are designed to withstand heavy loads for short durations. The number of tires required for aircraft increase with the weight of the plane. Aircraft tire tread patterns are designed to facilitate stability in high cross-wind conditions, to channel away water to prevent hydroplaning, and for braking traction. Aircraft tires are usually inflated with nitrogen gas in order to minimize the expansion and contraction due to the extreme changes in temperature experienced during flight. Aircraft tires generally operate at high pressures, up to 200 pounds per square inch for airliners and higher for business jets. Aircraft tires also include heat fuses which melt when a certain temperature is reached. Tires often overheat if maximum braking is applied during a rejected takeoff or an emergency landing. The fuses provide a safer failure mode, since the tire will no longer explode when overheated, but deflate in a controlled way, thus minimizing damage to aircraft or injury to people on the ground. Motorcycle tires are unique in that they must combine high load capacity with extreme cornering and traction requirements in a high temperature environment. Bias tire construction utilizes body ply cords that extend diagonally from bead to bead, usually at angles in the range of 30 to 40 degrees, with successive plies laid at opposing angles. Radial tire construction utilizes body ply cords extending from the beads and across the tread so that the cords are laid at approximately right angles to the center line of the tread, and parallel to each other. The advantages of radial tires include longer tread life, better steering control, and lower rolling resistance. Many tires used in industrial and commercial applications are non-pneumatic, and are manufactured from solid rubber and plastic compounds via molding operations. Solid tires include those used for lawn mowers, golf carts, scooters, and many types of light industrial vehicles, carts, and trailers. Solid (non-pneumatic) tires have also been designed for automotive use using special compounds of polyurethane, although have not yet been delivered for broad market use. Friction between the tire and the roadway causes the tread rubber to wear away over time. Government standards prescribe the minimum allowable tread depth for safe operation. 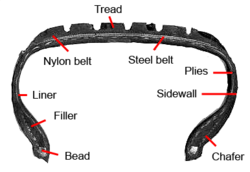 There are several types of abnormal tread wear. Poor wheel alignment can cause excessive wear of the innermost or outermost ribs. Overinflation can cause excessive wear to the center of the tread. Underinflation can cause excessive wear to the outer ribs. Tire manufacturers and car companies have mutually established standards for tread wear testing that include measurement parameters for tread loss profile, lug count, and heel-toe wear. Also can be known as tire wear. Dry traction is measure of the tire’s ability to deliver traction, or grip, under dry conditions. Dry traction increases in proportion to the tread contact area. Dry traction is also a function of the tackiness of the rubber compound. Wet traction is measure of the tire’s ability to deliver traction, or grip, under wet conditions. Wet traction is improved by the tread design’s ability to channel water out of the tire footprint and reduce hydroplaning. The tire tread and sidewall elements undergo deformation and recovery as they enter and exit the footprint. Since the rubber is elastomeric, it is compressed during this cycle. As the rubber deforms and recovers it imparts cyclical forces into the vehicle. These variations are collectively referred to as tire uniformity. Tire uniformity is characterized by radial force variation (RFV), lateral force variation (LFV), and tangential force variation. Radial and lateral force variation is measured on a force variation machine at the end of the manufacturing process. Tires outside the specified limits for RFV and LFV are rejected. In addition, tire uniformity machines are used to measure geometric parameters including radial runout, lateral runout, and sidewall bulge in the tire factory at the end of the manufacturing process as a quality check. When a tire is rotated it will exert a centrifugal force characteristic of its center of gravity. This cyclical force is referred to as balance, or imbalance or unbalance. Tires are checked at the point of manufacture for excessive static imbalance and dynamic imbalance using automatic tire balance machines. Tires are checked again in the auto assembly plant or tire retail shop after mounting the tire to the wheel. Assemblies that exhibit excessive imbalance are corrected by applying balance weights to the wheels to counteract the tire/wheel imbalance. A tire rotating at high speed will develop a larger diameter due to centrifugal forces that force the tread rubber away from the axis of rotation. As the tire diameter grows the tire width decreases. This centrifugal growth can cause rubbing of the tire against the vehicle at high speeds. Motorcycle tires are often designed with reinforcements aimed at minimizing centrifugal growth. Rolling resistance is the resistance to rolling caused by deformation of the tire in contact with the roadway. As the tire rolls, tread enters the contact area and is deformed flat to conform to the roadway. The energy required to make the deformation depends on the inflation pressure, rotating speed, and numerous physical properties of the tire structure, such as spring force and stiffness. Tire makers seek lower rolling resistance tire constructions in order to improve fuel economy in cars and especially trucks, where rolling resistance accounts for a high amount of fuel consumption. The United States Department of Transportation (DOT) is the governmental body authorized by congress to establish and regulate transportation safety. The National Highway Traffic Safety Administration (NHSTA) is a government body within the Department of Transportation tasked with regulating automotive safety. The Uniform Tire Quality Grading System (UTQG), is a system for comparing the performance of tires, established by the United States National Highway Traffic Safety Administration according to the Code of Federal Regulations 49 CFR 575.104. The UTQG standard rates tires according tread wear, traction, and temperature. The Tire and Rim Association (T&RA) is a standards organization authorized to establish tire and wheel manufacturing standards for all tires and wheels manufactured in the United States. The European Tyre and Rim Association (ETRTO) is the standards organization authorized by the European Union to establish and regulate tire and wheel manufacturing standards for all tires manufactured or sold in the European Union. The Japanese Automotive Tire Manufacturer’s Association (JATMA) is the standards organization authorized to establish and regulate tire and wheel manufacturing standards for all tires manufactured or sold in Japan. The Transportation Recall Enhancement, Accountability and Documentation Act (TREAD) Act is a United States federal law sets standards for reporting incidents related to unsafe product defects. Radio frequency identification tags (RFID) are passive transponders affixed to the inside of the tire for purposes of automatic identification. Tags are encoded with various types of manufacturing data, including the manufacturer’s name, location of manufacture, tire type, manufacturing date, and in some cases test data. RFID transponders can remotely read this data automatically. RFID tags are used by auto assemblers to identify tires at the point of assembly to the vehicle. Fleet operators utilize RFID as part of tire maintenance operations. Tire pressure monitoring systems are electronic systems that continuously monitor tire pressure on a vehicle, and alarm when the pressure goes below a warning limit. Proper tire safety requires attention to inflation pressure, tread depth, and tire repair. Over inflated tires can burst when subjected to excessive load due to cornering or ride disturbances. Under inflated tires can suddenly go flat and make the vehicle difficult to control. Excessive tire wear will reduce steering and braking response. Treads worn down to the carcass can also burst due to loss of air pressure. Tire inflation pressure and tread depth should be checked regularly in accordance with the manufacturer’s recommendations. Tires should be repaired only by experienced tire repair shops and in accordance with the manufacturer’s recommendations. All links retrieved December 9, 2015. Car Bibles : The Wheel and Tyre Bible – A good independent technical resource. This page was last modified on 9 December 2015, at 17:28.